Updated July 5, 2016 at 8:00 am: Revised drawings for Kennedy Station have been added showing better detail of the the LRT lines and a temporary bus terminal. Minor textual changes have been made in the article including an observation that the scope of replacement costs for removing the existing SRT structures will vary depending on the timing of shutdown and the degree to which existing structures are adapted/recycled. Updated at 8:45 am: The potential sources of cost overstatement for the updated LRT option have been summarized. With the recently announced increase in the projected cost of the Scarborough Subway Extension, the question of reverting to the original LRT plan for Scarborough has surfaced again. It is no secret that I favour this plan, but the political environment has been so poisoned that discussion of the options is, mildly speaking, difficult. When the Mayor feels that he must imply racism in critics who are simply trying to advocate for their view of a better transit system, Toronto politics are at a new low. However, the implications of the LRT plan must be addressed on their merits, not on simplistic political comments unworthy of the Mayor’s office. On June 29, the TTC issued a briefing note regarding the cost of the LRT option in the context of current events. The question here is whether the claims and assumptions behind this note are legitimate and represent what could be achieved with a “best effort”, as opposed to presenting a less attractive picture to give the impression that the LRT represents an unacceptable downside. Brad Duguid, Ontario’s Minister of Economic Development & Growth, also the de facto spokesman for the Scarborough Liberal Caucus, was on CBC’s Metro Morning talking about the planned Scarborough Subway Extension (SSE) and its fast-inflating estimated cost. Duguid had been quoted in the press a few days earlier as saying that downtown elitists have been opposed to the SSE from the start echoing the divisive us-versus-them context for so much of this debate. He likes to sound oh so reasonable, but his message is full of half-truths and puffery designed to support the “we don’t get our share” chorus so common from Scarborough pols and others. The [subway] project has been on the books for 30 years. Well, no, it hasn’t. The TTC’s original plan for Scarborough was that an LRT corridor would run northeast all the way to Malvern. (See Once Upon a Time in Scarborough and The Scarborough LRT That Wasn’t). More recently, the Transit City plan included an LRT network for Scarborough, and this received the endorsement of Council. Only when former Mayor Ford chose to use the potential of a subway as bait did Council change its mind. If anyone has a plan for a subway from Kennedy to STC that has more status than the back of a napkin or a fantasy map, I’ll be happy to see and comment on it. LRT was put in there as a political decision by the Davis government to promote UTDC globally. The UTDC was a provincial agency that concocted the RT technology, and they couldn’t get a sale if Toronto wasn’t buying. This technology is most emphatically not LRT, no matter what Duguid and others like to call it, for the simple reason that it requires a completely segregated right-of-way. The true LRT line was already under construction when Queen’s Park pulled the plug, and there are remnants of the LRT design still visible in the RT structures. Scarborough Town Centre is one of the fastest growing city centres in Canada. More generally, growth is not happening in the so-called centres which between them have less than 10% of the proposed development. The myth that the former “downtowns” of the old cities will become major nodes in their own right is neatly torpedoed here. Everyone is entitled to their views and opinions. In a classic “yes, but” statement, Duguid tries to undo his slur against those who criticize the SSE project, but goes on to talk of how Scarborough residents have been fighting for a subway for years. I [Duguid] have been involved in this debate for 30 years. All we’re asking for is that the fastest growing city centre be attached to higher order transit. Fighting for “higher order rapid transit” (a phrase he uses a few times without recognizing that it actually includes LRT), maybe, but not specifically for a subway. The problem for years has been that subways and the rattletrap SRT are the only points of comparison Scarborough riders have, and it’s a no-brainer to choose one over the other. The LRT option has always been undersold, and then under Rob Ford, denigrated as “streetcars” (said with a pejorative sneer) when in fact the SLRT could be entirely on its own right-of-way. The price came in over the estimate, but that was done a number of years ago. The price it’s come in at is the price it’s come in at. No. The estimate was updated in 2016 for Council’s decision to go with the “optimized” Scarborough plan of a 1-stop subway and the LRT from Kennedy Station to UTSC. Does Duguid now claim that Council made a multi-billion dollar decision on a flimsy, unreliable estimate? Not everyone who has opposed this is from downtown, but generally critics are people who are less than 10 minutes to a subway station from their homes. I don’t have the home addresses of the many SSE critics at my disposal, and there is no secret that I live within sight of Broadview Station. The point here is not where I live, but where people in Scarborough live, and most of them will not be within 10 minutes of the one remaining station on the SSE. Indeed, the “optimized” Scarborough plan does well on access not because of the subway, but because the LRT line to UTSC brings so many more people close to a station. Scarborough people have been paying for the subway system for years. It is important to the entire city. We have to think about more than our ridings. Duguid is getting too rich for words here implying that he’s not pushing the subway just to get votes even though his own party did just that, going along with Rob Ford’s fictional ideas about transit planning rather than opposing him. Yes, Scarborough has paid taxes for years into the pot, as has every other part of Toronto, including Etobicoke which is not exactly subway-rich. The SSE tax as well as development charges for new transit generally fall overwhelmingly on buildings nowhere near Scarborough, and the subway will be built mainly by funds raised outside Scarborough borders. That may be a fair trade, but not if the pricetag keeps going up and up, and not if other transit projects are cancelled to pay for it. Yes, Scarborough too must think about more than itself, and stop acting like a brat who only wants the most expensive toy in the shop window. Scarborough has been paying for years, but the minute something is going to SCC, such a big deal is made out of it. It’s easy for folks with higher order transit to oppose it, but it’s important to the people of Scarborough. It is a flat out lie to say that people elsewhere in Toronto oppose “something going to SCC”. The problem here is that Duguid wants only a subway and will accept nothing else. We all need and want more and better transit, but we can’t have it when every penny is vacuumed up for one project. Ridership numbers have to be put in perspective. STC is the first station in the system, and if the line were full here, people wouldn’t be able to get on elsewhere. It will be the 7th busiest station. If we had only looked at [terminal] ridership, we wouldn’t have built any of the subway lines. Both the Yonge and Bloor subways were built in corridors where surface transit was already carrying thousands more riders than the RT is today, and where there was a concentrated demand to carry people from their homes to jobs downtown and on other parts of the (mainly) streetcar network. The same is not true for Scarborough, especially for transit carrying people to jobs at STC. The Yonge extension was built to carry the very heavy demand pouring into Eglinton Station on buses from the north. The Spadina line was partly to relieve this, and partly to serve Yorkdale Mall not to mention sanitizing the proposed Spadina Expressway corridor. The extension through York University to Vaughan is well documented as a political creation, not the result of planning that would have independently justifed a line that far north. That claim brought a guffaw from host Matt Galloway. The whole project has always been about politics, about being a “subway champion” for Scarborough and telling people how hard you are fighting for what they have been convinced they need. The fact is that I’ve been supporting this since before I got into public office, for nearly 30 years. Scarborough residents take it very seriously. The subway will fulfill our full potential, and I fight strongly for it. Actually, Scarborough has very substantial travel demands that have nothing to do with the Town Centre, and the subway won’t help them one bit. Moreover, most people who work at STC don’t originate from areas served by the subway network (or particularly well by transit) and they drive out of preference or because they have no choice. Duguid and company have painted themselves into a corner by backing an option that is increasingly beyond the level where mutual back-scratching at Council and a hope for peace in the family will bring approval for the project. They’re now stuck having convinced voters that there is only one option, and that if Scarborough doesn’t get it, this will be the rich, elitist, downtown Toronto blocking their manifest destiny. One might ask the same of City Councillors and the Mayor who short change transit at every opportunity and may even cut service rather than raise taxes and fares to pay the bills in 2017. Our government already would have contributed 2/3 of the original cost estimate. We are the major contributor, and are unwavering in support. We will give the city the space to determine what the plans might be for the other part of the project – the line to UTSC – but we’re not in a position to commit more money. In other words, don’t come to Queen’s Park looking for a handout, and if you have to raid the piggybank for the billion you thought you had for the UTSC LRT, then that’s Toronto’s decision. Needless to say, Duguid does not represent the ridings that the LRT would serve. The real issue here is why a provincial Minister gets away with making such inflammatory statements about a decision which, in theory, is Toronto’s to make. Queen’s Park will spend the same dollars on Scarborough regardless of what is built, but they gingerly avoid commenting on which plan they prefer. We’re getting almost an announcement a day from the Wynne government about transit expansion, even for some LRT funding, but Queen’s Park has stayed out of the Scarborough debate until now. When the bill comes due for the extra cost of a one-stop subway, when the hoped-for line to UTSC vanishes from the map, will Duguid or Wynne be anywhere to be found? The Star’s Jennifer Pagliaro reports that City Council has approved a confidential settlement with BILD, the Building Industry and Land Development Association, to avoid an Ontario Municipal Board hearing that could lead to rejection of the Bylaw implementing the Development Charges intended to pay for the Scarborough Subway. The matter was before Council in confidential session on June 7, 2016. Staff miscalculations on the ridership of the Scarborough subway will leave taxpayers on the hook for millions more, after city council voted to settle a dispute with developers. According to a secret report before council on Tuesday, the contents of which were shared with the Star, the city’s lawyers advised councillors to accept a settlement with the group representing developers, the Building Industry and Land Development Association (BILD). The settlement, which reduces the amount builders will have to pony up to help finance the subway, is expected to cost the city as much as $6 million in lost revenues. If the settlement is for only $6 million, the City should consider itself lucky because the calculation underlying the DCs is based on flawed ridership estimates and an out of date network design. Moreover, the original authorization appears to double count subway revenue with both a special Scarborough Subway Tax and Development Charges to recover the same costs. Recent news of a 50% reduction in expected Scarborough Subway ridership from 14,100 to 7,300 passengers in the AM peak hour reignited political debate on the viability of the subway scheme. However, these numbers are not just hypothetical indicators of how the line might perform, they are integral to the calculation of Development Charges (DCs) that would help to fund the City’s share of this project. The formula to calculate development charges is complex, but at its heart is one key measure: how much of a new transit project will benefit existing properties versus future development. If the primary role of a new subway is to improve the lot of current riders, then only a minority of its cost can be recouped by DCs (and thus from future purchasers of new properties). Toronto allocates DCs on a city-wide basis rather than assigning each project only to the neighbourhoods it will directly serve. These charges already help pay for many projects as shown in the introduction to the study establishing the level of new charges for the SSE. For commercial property, there is some justification to this because increased mobility makes travel to jobs simpler well beyond the location of any one project. For example, the Scarborough Subway might be held out as a way to stimulate growth at the Town Centre, but it would also reduce commute times to other parts of Toronto, notably downtown. 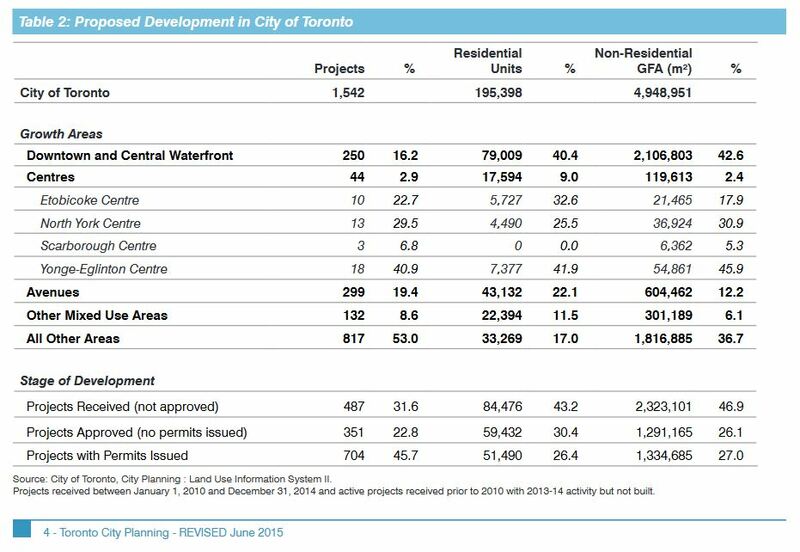 For residential property, especially for the large proportion of new development downtown, this link is less clear, and DCs on new condos can wind up funding transit projects of little benefit to the new residents. This split is part of the eternal battle between sharing the cost of public services across the city and charging them locally or by user group. In the case of the Scarborough Subway Extension (SSE), the split between new and existing beneficiaries was determined by the change in ridership projected with the subway project. The benefit was allocated 61% to new development and 39% to existing riders. The ratio is high because, at the time of the calculation, the projected peak hour ridership for the SSE was estimated at 14,100 compared with a base value of 5,500. Both of these numbers are suspect. The base value was factored up from actual SRT ridership of 4,000 per hour to 5,500 to represent the load the subway would have had were it to exist in 2015. That value of 4,000 is equivalent to a load of about 240 per train when the peak service was 17.14 trains/hour (3’30” headway) as in 2012. However, by 2013 service had been cut to 13.33 trains/hour (4’30” headway) to reduce equipment requirements on the aging line. That is the service operating today, although a further cut to 12 trains/hour (5’00” headway) is planned for June 20, 2016. Some of the demand that would be on the SRT travels via alternate routes, some is packed into fewer trains, and some has probably been lost to the TTC. What the ridership might be today were the RT not capacity constrained is hard to tell, but it should certainly be higher. The high value for future subway ridership combines with the low value for presumed current demand to load much of the SSE’s cost onto new development. A line to Sheppard will attract more ridership than one ending at the STC. A subway station at Sheppard, in the absence of improvements to the GO corridor such as RER and SmartTrack, will attract ridership from Markham just as Finch Station does from the Yonge corridor north of Steeles. Removal of the station at Lawrence East, coupled with new GO corridor services, will reduce demand on the subway. There is no guarantee that the land use, job and population assumptions underlying the three estimates are the same, especially when the highest number was produced in the context of boosting the importance of STC as a growth centre. What we are left with, however, is the likelihood that the level of DCs allocated for the Scarborough Subway project were based on the most optimistic scenario for new ridership, and a network configuration quite different from what will actually be built. If the calculation had been done on the basis of lower ridership numbers, the DC revenue available to fund the Scarborough Subway would have been considerably lower.